What a refreshing change to see a high quality ladies final at Roland Garros after so many recent years of non-events. When Eastern Europe has featured in the women’s flagship match here the result has nearly always been a disappointing match of one dimensional baseline slogging. Back and forth until someone makes an error. It was thus a special treat to be transported back to the days of yore, where skill and tactical nous, not power could seal the title. With an off form Justine still not quite ready to dominate on the clay again, and Serena perhaps a little complacent on a surface she least enjoys it was Samantha Stosur – conqueror of both who entered yesterdays match as clear favourite. Playing powerful yet varied tennis the Australian has seemingly pushed aside those nervy demons once and for all. No matter, her opponent had quietly scythed her way through the field and through the even without the loss of a set – and for Francesca Schiavone just reaching the final was a monumental achievement and frankly, overdue. Consistently a quality player who has remained comfortable in and around the top twenty for the last decade, the Italian loves the clay. 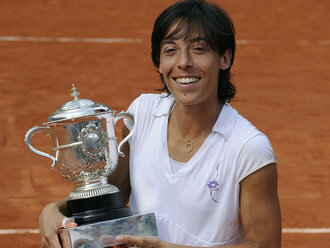 Slight in stature and as wily as a fox, Schiavone showed us that precision and intelligence, as well as self belief can overcome power and hard court tactics. In a fine match at last worthy of the final, the Italian triumphed in a tactically and visually pereect display which denied Stosur any sort of foothold. Even at 1-4 down in the second set, where before she may have wilted, Schiavone persevered and came through 6-4, 7-6 (7-2). It will be exciting to see where if these two can now consolidate their new found positions amongst the elite – given the relative rut the Ova’s are currently in, I would fancy a prolonged stay in the top ten. The men’s title despite the heroics of a certain Swede and the connotations of last year, really only had one name on it this year once the Fedex took a major wrong turn in the quarter finals. Robin Soderling was again in inspired form these two weeks, his brutal game suiting the red clay to a tea. The Swiss was thoroughly outplayed. On final day it was Rafael Nadal – the man he so famously and admirably dumped out of the tournament last year – who would stand in the way of a first Slam for the Swede. This time though, as was clear from the very first ball hit in Paris, that Nadal was back to his devastating best and the memories of last year instead of haunting him, would inspire him with a fiery self belief that is terrifying in its ability to galvanise his play even further. Imperious, impossible, inspiring, Nadal was nothing short of unplayable today – yes the 5 set marathon against equally impressive Berdych would have left Soderling a little spent, but even at his best, now that the conditions once again suited the Spaniard – there was nothing he could do. Hopes of a repeat of the classic the two men shared last year were dashed early on, everything the tired Soderling threw at Nadal was batted back – balls relentlessly returned at awkward angles and with more pace and spin than an ashes throw at lords. It was all over in straight sets – Nadal having dropped none in two weeks. 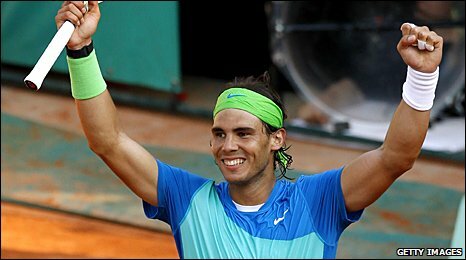 With his fifth Roland Garros title, Rafa also takes the number one spot once more – it will be fascinating to see him, Federer and all the other finalists and form players adapt to the green grass of Wimbledon – there may well be some surprises this year.